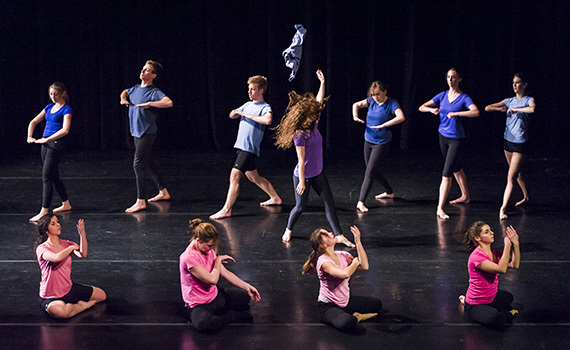 In the last movement of her dance performance titled Wires, April Bailey ’14 (pictured in pink) breaks free from the group and moves independently — just as she’s demonstrated academically. 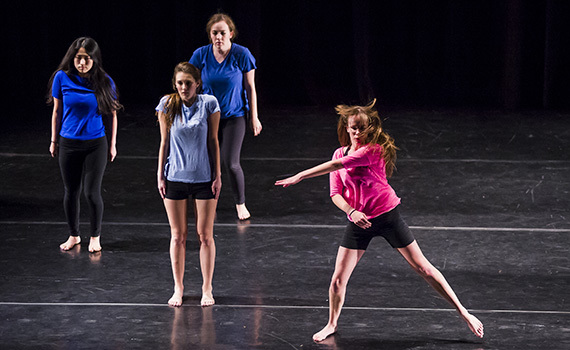 Choreographed and directed by Bailey, Wires was a complementary performance to her women’s studies and psychology research on gendered ways of moving. The performance drew from a famous essay by Marilyn Frye “that uses the metaphor of a birdcage to explain how different iterations of oppression intersect to confine individuals,” Bailey said. The November event, which drew more than 160 people to Brehmer Theater, concluded Bailey’s fall-semester independent women’s studies class with Professor Mary Simonson. Bailey, who began dancing at the age of 8, was mainly trained in classical Russian ballet, and is a member of Colgate’s contemporary/modern group FUSE Dance Co. Featuring 17 dancers, Wires was composed of four movements. The first asked the audience to consider the ways social mores and customs about gender constrict behavior; gender was marked by shirt color (blue, pink, or purple) following stereotypical associations. The second movement considered how sexual desire maps onto expectations about gender, with heterosexuality being the socially expected model. The third presented one of the unfortunate consequences of strict gender norms: gender-based violence and manipulation. The fourth provided a space for rebellion and genuine expression of the self, regardless of gender stereotypes. “A moving image is visceral, [so] people don’t get sidetracked by words that they don’t understand or that they have negative associations with,” Bailey said. Indeed, some might be unfamiliar or uncomfortable with the topics she explores. The performance even took the dancers outside of their comfort zones, which was revealed during an engaging Q&A discussion afterward. Danielle Iwata ’15, who performed a duet with Bailey during the fourth movement, also chimed in: “I was the masculine character, and it was definitely different for me,” she said, adding that another dancer commented that she wasn’t necessarily acting like a man but, rather, like a dominator. “This demonstrates the project’s effectiveness in inciting a conversation about gender and sexuality on campus,” Bailey said. The project continues to influence Bailey’s work.